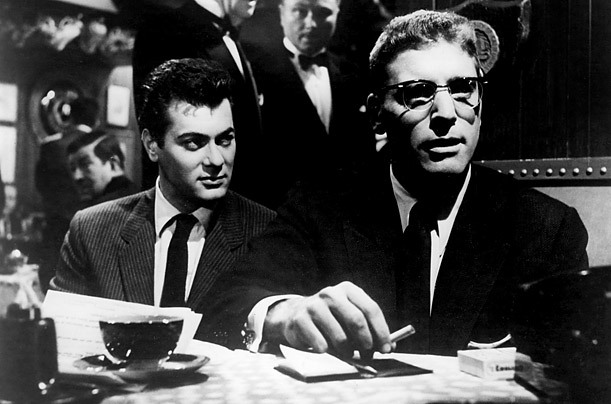 Alexander MacKendrick’s Sweet Smell of Success would easily rank alongside Billy Wilder’s Sunset Blvd. and Ace in the Hole as one of the blackest, nastiest and most acerbic film noirs ever made. The film lays naked the narcissism, greed and corruption-filled world of the powerful gossip columnists and PR men of New York. This incredibly photographed movie, where the Big Apple is portrayed as a seedy, ominous and claustrophobic urban jungle courtesy oblique camera angles and disorienting visuals, boasts of two stupendous performances. Burt Lancaster has given a volcanic turn as a cynical, malicious and misanthropic showbiz columnist J.J. Hunsecker who doesn’t think twice before trampling on other people’s lives, while Tony Curtis is equally electrifying as Sidney Falco, a parasitic and sycophantic press agent who'd sell his mother to have his news in J.J.'s columns. Emile G. Meyer, too, is brilliant as an evil, malevolent cop. The protagonists abound in apathy, deceit and complete lack of scruples as J.J. makes the fawning Falco destroy the life and career of a guitarist who has shown the temerity of dating his sister. This bleak, nihilistic and arsenic-filled depiction of the sleaze and intoxicating allure of power and money, also boasts of an absolutely terrific, at times even devastating, jazz score, that managed to further accentuate the tone and mood of this relentlessly dark and disturbing film. 5 stars might not even be enough for me! Quite simply, this is one of my top 4-5 favorite movies of all time. The one-two punch of Lancaster and Falco makes me shake my head in disbelief every time I watch it... they are just so good. You capture the atmosphere and strong points perfectly in in this capsule. One of the best of all time! Thanks Dave. I feel almost as strongly about the movie as you. Your countdown compelled me to watch the film, and boy was I bowled over by it! Be it the performances, the crackling dialogues, the fascinating cinematography or the brilliant score - everything's nearly as perfect as it gets. "The film lays naked the narcissism, greed and corruption-filled world of the powerful gossip columnists and PR men of New York. This incredibly photographed movie, where the Big Apple is portrayed as a seedy, ominous and claustrophobic urban jungle courtesy oblique camera angles and disorienting visuals, boasts of two stupendous performances...."
Boy, you ceaselessly master word economy Shubhajit, and I can't really say it enough. This is a very great film, and Dave Hicks rendered it the ultimate honor in his recent countdown. It's one film you can never get enough of, and in a sense it's a model of its kind. Thanks a ton Sam. Couldn't agree with you more, this is one hell of a movie. And I can't thank Dave enough for compelling me to watch the film by placing it at the top of film noir heap. "Alexander MacKendrick’s Sweet Smell of Success would easily rank alongside Billy Wilder’s Sunset Blvd. and Ace in the Hole as one of the blackest, nastiest and most acerbic film noirs ever made." Your statement here hits the nail right on the head. Lancaster and Curtis were never better and the bright lights of 1950's New York never looked any brighter.